On a chilly fall evening in 1998 my wife, Patti and I stood on a street corner and watched as a fire consumed our church home. As the flames shot up into the evening sky, as water from the fire trucks found their place in the flames, and as what was once a church home to many for nearly a hundred years fell to ashes the entire scene seemed to be laughing and crying at the same time. In today’s scripture Peter talks about God inviting us to share in his “wonderful goodness”. As I look back on that fall evening years ago I understand and experience it now as God’s invitation to step out of the ruble of a crumbling imperfect world and into God’s world of perfection and permanency. In chapter 3 of Revelation the Holy Spirit talks about Jesus opening a door that no one can shut. I believe Jesus is in fact the Door that opens up God’s world of perfection and permanency. 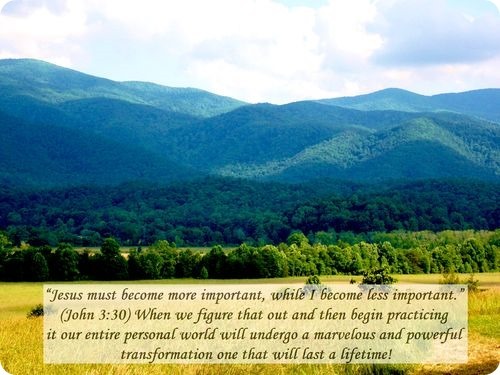 I believe John the Baptist can be given credit for the one of the most powerful and far reaching statements in the bible, “Jesus must become more important, while I become less important.” (John 3:30, CEV) When we figure that out and then begin practicing it our entire personal world will undergo a marvelous and powerful transformation one that will last a lifetime! Scripture marked CEV are taken from the Contemporary English Version © 1991, 1992, 1995 by American Bible Society, Used by Permission.